Bio char is the carbon-rich solid product resulting from the heating of biomass in an oxygen-limited environment. Characterization aims to document the basic features of a bio char and to ensure that it is safe to apply as a soil amendment. It is also appropriate to quantify the key properties that may give rise to the beneficial qualities of bio char. The crop wastes like Rice husk, Prosopis wood, Maize straw, Cotton stalk and Red gram stalks were mobilized in huge quantities and their respective bio char were produced by traditional heap method and pyrolysis method. Pyrolysis method of bio char production can yield up to 40-50% of bio char. whereas traditional heap method can yield only 30-33%. The pH of the bio char materials were high ranging from 9.8 to 10.6. Among the five bio char materials produced, cotton stalk bio char registered highest organic carbon content of 7.62% followed by rice husk bio char 34.6 g/kg-1 that serves as better source for carbon sequestration under rain fed cotton cultivation. Maize Stover bio char registered highest CEC of 45 C. mol(+)/kg of soil. The moisture content of the final bio char products are in the range of 4.0-5.2%. Similarly maize stover bio char registered highest available nitrogen, and potassium contents of 0.0089 and 1.2% respectively. The bio char produced from red gram stalk bio char recorded highest available P content of 0.14%. Bio char, Nutrients, Crop wastes. Bio char addition can result in elevated quantities of bio-available nutrients such as nitrogen, potassium and metal ion [1,2], but has also been shown to lead to decreases particularly of nitrogen availability . These changes in soil nutrient availabilities may be explained by some of the following observations. Additions of bio char to soil alters important soil chemical and physical properties such as pH (has caused both increases and decreases), and typically increase soil Cation Exchange Capacity (CEC), and can lead to greater water holding capacity (WHC), while generally decreasing bulk density . Increases in soil pH towards neutral values , in addition to increased CEC , may result in increases in bio-available P and base cations in bio char influenced soils. Additionally [1,2,6], showed that bio char itself contained small amounts of nutrients that would be available to both soil biota (including mycorrhizal fungi) and plant roots. Lastly, DeLuca et al. showed that bio char from forest wildfire stimulated gross and net nitrification rates, most likely mediated by bio char adsorbing inhibitory phenols. The crop wastes like maize straw, cotton stalk and red gram stalks were mobilized in huge quantities and their various bio char respectively were produced by employing by pyrolysis method at CRS, Veppanthattai and were transported to AEC & RI, Kumulur for application in experimental field. 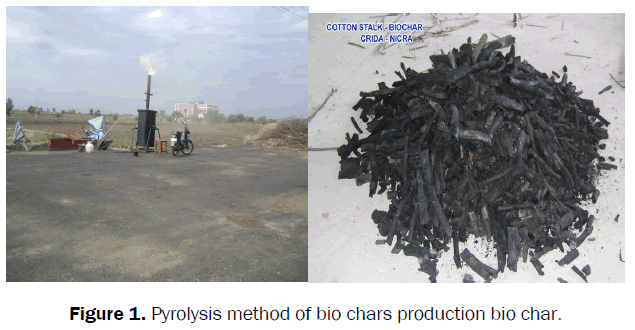 Figure 1 shows Pyrolysis method of bio char production and bio char produced from it. Figure 1: Pyrolysis method of bio chars production bio char. The crop wastes of 1 kg are converted into its bio char under anaerobic condition in pyrolysis unit. Both conventional and pyrolysis method of bio char production were compared for their bio mass conversion efficiency and time requirement The bio char production under Pyrolysis method can yield up to 40-45% of bio char whereas conventional method can yield only 30-36%. The time taken for the conversion process was less in pyrolysis method when compared to conventional method. Table 1 shows bio char conversion efficacy of different plant products in conventional method compared to that of Pyrolysis method along with conversion time. Table 1: Working out conversion efficiency and time of crop wastes into bio char under conventional and pyrolysis method. Bio char is the carbon rich solid product resulting from the heating of biomass in an oxygen-limited environment. Characterization aims to document the basic features of a bio char and to ensure that it is safe to apply as a soil amendment. It is also appropriate to quantify the key properties that may give rise to the beneficial qualities of bio char. Table 2 shows characterization of bio char from crop wastes for their nutrient composition. Table 2: Characterization of Bio char from crop wastes for their nutrient composition. The pH of the bio char produced from agricultural feed stock materials ranged from 8.0 to 10.8 which are of alkaline range. Among the various feed stock materials used, red gram stalk bio char (10.8) and cotton stalk bio char (10.6) of high in alkaline reaction. Rice husk bio char registered low level of salinity (0.22 dS m-1) whereas the other feed stock materials (0.75 to 0.97 dS m-1) are likely to develop moderate level of salinity. Among the various agricultural feed stock materials, the cotton stalk bio char registered highest organic carbon content of 76.2 g kg-1 followed by rice husk bio char 34.6 g kg-1. The others are in the range of 17.28 to 25.54 g kg-1. The bulk density of bio char materials ranged from 0.39 to 0.51 Mg m-3. Prosopis wood bio char registered the highest bulk density of 0.51 Mg m-3 and the lowest values were registered for maize stover bio char. The CEC of bio char varied from 32-45 C. mol(+)/kg. Maize stover bio char registered highest CEC (45 C. mol(+)/kg) and BET surface area. The lowest CEC was recorded for rice husk bio char. The BET surface area ranged from 0.6 to 1.5 (m2/g). The lowest BET surface area was registered for prosopis wood bio char. The nutritional composition of bio char materials varied from its source of feed stock materials. The total N varied from 0.67 to 2.06%. The bio char produced from maize stover registered highest total N of 2.06%, total P of 0.84% and total K of 4.25%. The lowest total N of 0.67% was in cotton stalk bio char, and the lowest total P of 0.13% and total K of 0.20% were recorded for bio char produced from prosopis wood material. The moisture content of the final bio char products are in the range of 4.0-5.2%. Similarly maize stover bio char registered highest available N, and K contents of 0.0089 and 1.2% respectively. The bio char produced from red gram stalk bio char recorded highest available P content of 0.14%. The lowest available N, P and K contents were recorded for propsopis wood bio char. Soap test and crush tests were performed under laboratory to check the physical quality of bio char materials. The results revealed that all the bio char materials were well pyrolysed and were rinsed with water after thoroughly been rubbed with hands. Also, all the bio char materials have been easily crumbled with hands except prosopis wood bio char. Bio char prepared from agricultural bio mass like cotton stalk, maize stover, rice husk, prosopis and red gram stover can very well be suggested as soil ameliorant for low pH soils. Bio char is also known to improve soil nutrients like nitrogen, phosphorus and potassium by having large CEC and low bulk density. Among the different bio char materials cotton stalk bio char registered highest organic carbon content which can be very well used for carbon sequestration studies. Lehmann J, et al. Nutrient availability and leaching in an archaeological Anthrosol and a Ferrasol of the Central Amazon basin: fertilizer, manure, charcoal amendments. Plant Soil 2003;249:343-357. Gundale MJ and DeLuca TH. Temperature and source material influence ecological attributes of ponderosa pine and Dougals-fir charcoal. For Ecol Manag. 2006;231:86-93. Tryon EH. Effect of charcoal on physical, chemical, and biological properties of forest soils. Ecol Monogr. 1948;18:81-115. Lucas RE and Davis JF. Relationship between pH values of organic soils and availabilities of 12 plant nutrients. Soil Sci. 1961;92:177-182. Glaser B, et al. Ameliorating physical and chemical properties of highly weathered soils in the tropics with charcoal- a review. Biol Fert Soils. 2002;35:219-230. Topoliantz S, et al. Manioc peel and charcoal: Potential organic amendments for sustainable soil fertility in the tropics. Biol Fert Soils. 2005;41:15-21. DeLuca TH, et al. Wildfire–produced charcoal directly influences nitrogen cycling in ponderosa pine forests. Soil Sci Soc Am J. 2006;70:448-453.